While some people love safe sports like football, others live for sports that get adrenaline pumping through their veins. The National Water Sports Centre is one institute that caters for adrenaline junkies and adventure lovers. 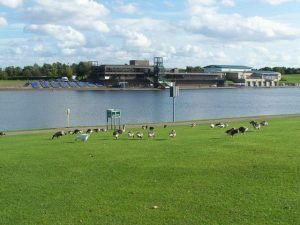 It sits on the 10 acre Holme Pierrepont Country Park in Nottingham, UK. The National Water Sports Centre is managed by Nottinghamshire County Council which hired Serco Operations Limited to run it. The centre provides both water based and land based activities. National Water Sports Centre is located on a beautiful location with views of the 2 km Regatta Lake and wildlife living in the park. Much like all national sports centres, it has a gym. Matter of fact, two fully equipped gymnasiums with treadmills, squat racks, lifting platforms, power plates, free weights, virtual training bikes and many others. One is an elite strength and conditioning gym, and the other a 60 station life fitness gym. The latter has glass walls that enable gym members to experience beautiful views of the lake while working on their fitness. There is no crowding or congestion in the gym. There is a 700 m white water canoe course, a 6 lane rowing course, four conference rooms, fitness classes, nature trails, lagoons, a restaurant, and the Lakeside café that serves hot and cold food from 7:00 a.m to 2:00 p.m. Accommodation is provided for within the grounds. Several options are available. First, there is a cottage that houses 11 called The Elms. Second are the 54 fabulous lakeside en-suite rooms. The third and fourth options are for campers. The 18 acre campsite facilitates campers to put up tents and vans. The staff on the other hand provide warm, cosy wooden huts (camping arches) and 5 Tipis for campers who love the glamorous things in life. These Tipis have electricity and four beds. Activities offered include white water rafting, white water tubing, wakeboarding, kayaking, canoeing, stand-up paddle boarding, foot golf, lagoon wipeout, e-combat laser tag, sky trail, segways, wall climbing, white water duckying, and the list goes on.